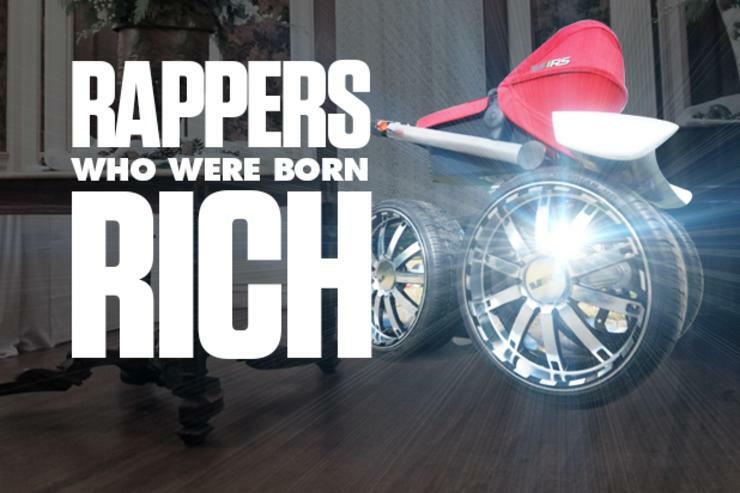 Top 10 rappers and artists who were born rich. Many hip-hop artists have rapped about life experiences like starting from the bottom, the struggle and the drug game. The come-up story has always been a selling point for many artists through the years. Some of your favorites like Lil Wayne, B.I.G., Jay Z, Nas, 50 Cent, and more have experienced this and have shared it through their music. However, there is a new trend popping up in hip-hop culture of young, incredibly wealthy artists aiming to be the next big rapper. For many of these young artists, like Diggy Simmons and Jaden Smith, the struggle of the streets was never a reality. As "celebukids" or rich kids, hip-hop is simply a way to express themselves in an art form or follow their fathers' or family's legacy. Check out these 10 rappers who were born rich, and find out where all that family money came from. Not only was Jaden Smith born rich to actors Will and Jada Pinkett Smith, he is also one the highest-paid child actors in Hollywood, and now he is taking a stab at rapping. Rapper O'Shea Jr., aka OMG (Oh My Goodness), is the son of rap legend and actor Ice Cube. Cube began his career as a member of the hip-hop group C.I.A. and later joined N.W.A. Since then, he has accomplished more and is currently worth nearly $100 Million. Also known as Romeo Miller, Lil' Romeo's father Master P put him in the rap game at the young age of five. Romeo has had platinum records hanging on the wall since before he was even in the first grade. Richard James Hilfiger, better known as Ricky Hil, is a rapper, singer, actor, co-CEO of Young, Rich & Famous and owner of Heart Culture Clothing. He is also the son of fashion mogul Tommy Hilfiger. Redfoo is a rapper, producer, dancer and DJ best known for his part in duo LMFAO. His parents are Berry Gordy Jr., founder of the Motown record label, and writer-producer Nancy Leiviska. He formed the duo with his nephew Sky Blu in 2006 and they released two studio albums before going on hiatus in 2012. Alan Daniel Maman, aka The Alchemist, was a well-off kid growing up in Beverly Hills (90210). He went to high school with Angelina Jolie before deciding to pursue his hip-hop career with good friend Scott Caan, son of actor James Caan. The Alchemist has done well for himself and is currently working as a DJ with Eminem, and is also signed to his label Shady Records as an in-house producer. Gabe is the son of Oscar award-winner Daniel Day Lewis. Instead of following in his father's footsteps and becoming an actor, he has decided to become a rapper. His first single, titled "Green Auras," uses J. Cole's "Let Nas Down" for its beat. Chet Haze, also known as Chet Hanks. This rapper was able to personally finance his own hip-hop career, thanks to very rich dad/actor, Tom Hanks. Chet falls into the same "celebukids" category as Ricky Hil. Diggy definitely grew up on the rich side, seeing how his uncle is media mogul Russell Simmons and father is the Rev Run, a founding member of the influential hip-hop group Run–D.M.C.. The talent has definitely been passed down as Diggy, who is successful in his own right and continues his family's hip-hop legacy. Jermaine Durpi's dad is Michael Mauldin, who is the former president of Colombia Records. Durpi got his start in the entertainment industry as a dancer for Whodini. Since then however, he has definitely made his own mark on the hip-hop world with his own success.